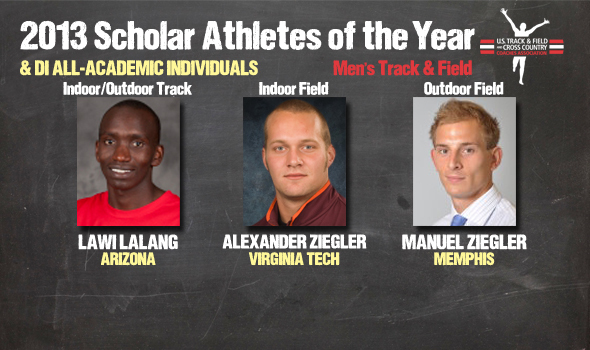 NEW ORLEANS – Lawi Lalang of Arizona, Alexander Ziegler of Virginia Tech and Manuel Ziegler of Memphis have been named the Scholar Athletes of the Year in Division I for the 2013 men’s track & field seasons by the U.S. Track & Field and Cross Country Coaches Association (USTFCCCA), the association announced Wednesday. Based on their combination of academic accomplishments and athletic feats, these three men stood out among a group of 448 men who earned USTFCCCA All-Academic distinctions. The full breakdown of All-Academic selections can be found below. Lalang, a junior public health major with a 3.356 cumulative grade point average, earned both the indoor track and outdoor track Scholar Athlete of the Year — the first time a male has swept the two since David McNeill of Northern Arizona in 2010. Sweeping was a common theme to Lalang’s athletic performances this year, as well, as the Eldoret, Kenya native swept the mile and 3000 meters titles at the NCAA Indoor Championships and the 5000 and 10,000 meters crowns outdoors. As a result, he is one of the three men’s finalists for The Bowerman. Alexander Ziegler, a senior management major with a 3.72 cumulative GPA, earned the indoor field award after winning the weight throw, extending his streak of consecutive years as a Scholar Athlete of the Year to three following outdoor awards in 2011 and 2012. The native of Dischingen, Germany, finishes his career tied with Ryan Whiting of Arizona State as the only three-time indoor/outdoor field Scholar Athletes of the Year. Manuel Ziegler, a sophomore international business major with a 3.79 cumulative GPA, claimed the outdoor field award with a runner-up finish in the triple jump. This is the first Scholar Athlete of the Year award for Ziegler, who hails from Neustadt, Germany. Including the Scholar Athletes of the Year, a total of 448 men from 149 institutions earned USTFCCCA All-Academic honors for their combined efforts in competition and in the classroom. For the second consecutive season the BYU men top the list with 16 honorees. Nebraska’s three-year run atop the standings was snapped, but the Huskers claimed the second-most in 2013 with 12. Fellow Big Ten schools Minnesota and Indiana each earned 11 honors, while Arkansas was fifth with nine.